Cruising the Mississippi River - click next. telling you about, then the remaining bridges on this route are not an issue. Grafton, ILL which is mile 0 on the Illinois River. 38.849' / W 087° 33.678' is just outside the T.J. O’Brian Lock. Grafton Harbor Marina 120-miles away. available, there are marinas or anchorages. No Fuel or services, just free dock. regardless of boat size. It’s worth the stop just to eat! with power and a police station on sight. It is also a short easy walk to restaurants and there are several museums. 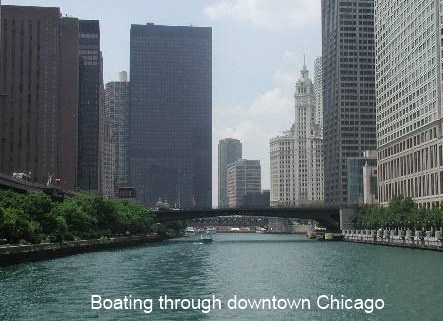 Shortly after departing Joliet you will arrive at the Brandon Road Lock & Dam - Mile 286, followed by the Dresden Lock & Dam - Mile 271.5.
harbor which is part of a Marina Resort. The Red dog Grill (can’t miss it), is a great place to eat. Glass Studio. This studio is located near Starved Rock State Park. room at the free dock. It is a well-maintained, just a short walk to the grocery store, restaurants, a cheese shop, and a YMCA. Starved Rock Yacht Club is at 234.6.
your boat (and how polite you ask) the Lock Master will give you permission to tie up outside the lock for Free, provided there is room. decide and determine if cruising America's Great Loop is in your future. & Canadian boater's Bucket List. America's Great Loop is simply one amazing adventure! American Experience' as it is a boating adventure. For comparisons sake, while this Website contains 30-pages, "The Looper's Companion Guide"
planning, preparing making this voyage. 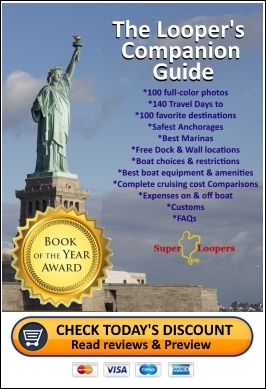 It includes everything you need to know from boat to budget. and even protection from fleas.